Thanksgiving seems like a distant memory after 10 glorious days in the sunny Caribbean celebrating our 20th wedding anniversary. But I do want to share some of our Thanksgiving dinner with you as it was one of the best and most fun holidays in many years! Coming soon will be some unusual recipes from the Virgin Islands including Curried Goat and Chicken Foot Soup...stay tuned! 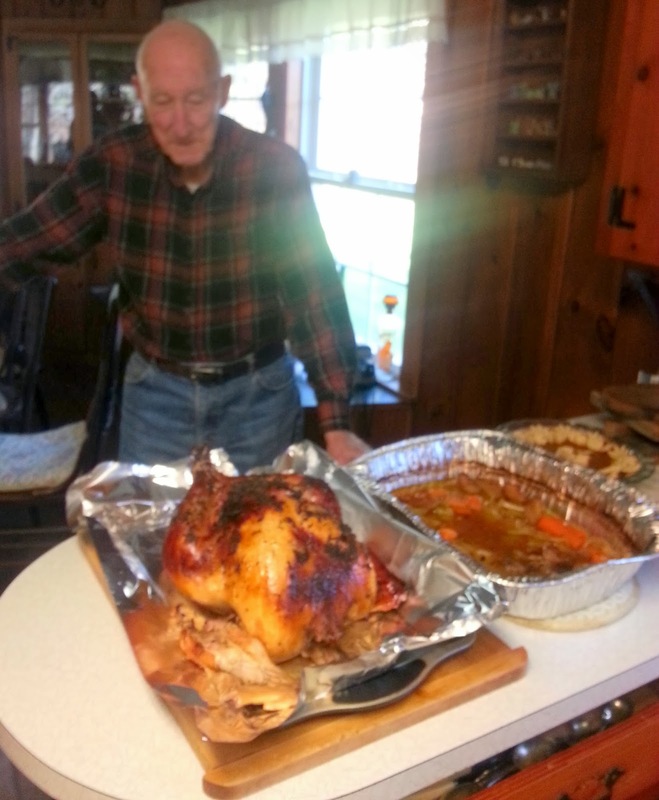 Dad surveying the turkey right out of the oven. The Herb Crusted Brined Turkey with Apple Cider Gravy was the best turkey any of us had ever had. Really worth the effort and will become our annual turkey tradition! 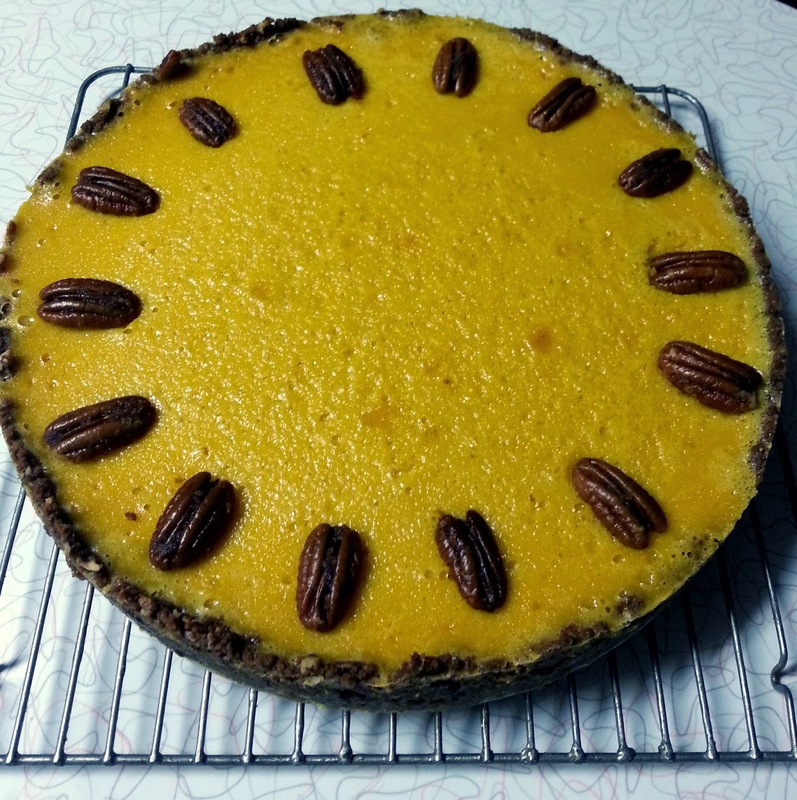 You can find the complete recipe on my most recent blog. 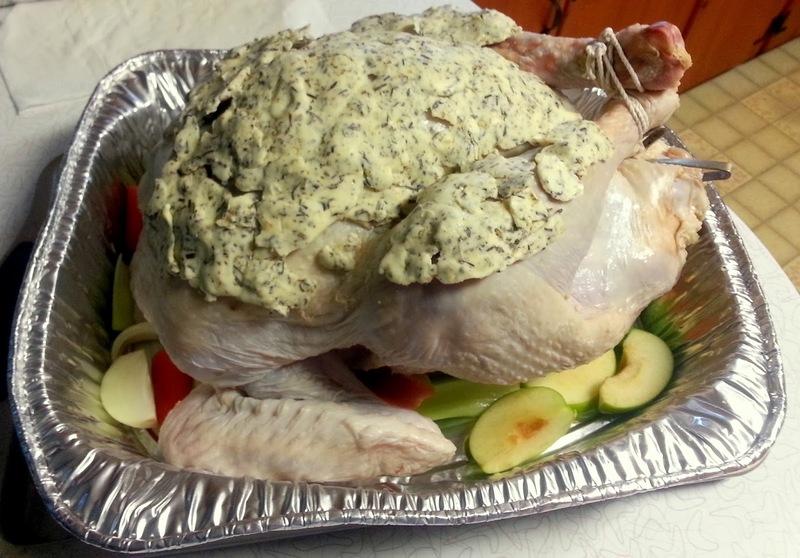 Here's a shot of the bird with his Herb butter crust ready to go into the oven. I made two diversions from the recipe. #1: I used 2 sticks of butter for the herb crust, rather than 3. That seemed like a lot even for me! #2. I stuffed the turkey with my husband's grandfathers bread stuffing recipe made with sausage, apple, raisons, onion, garlic, and lots of fresh herbs. 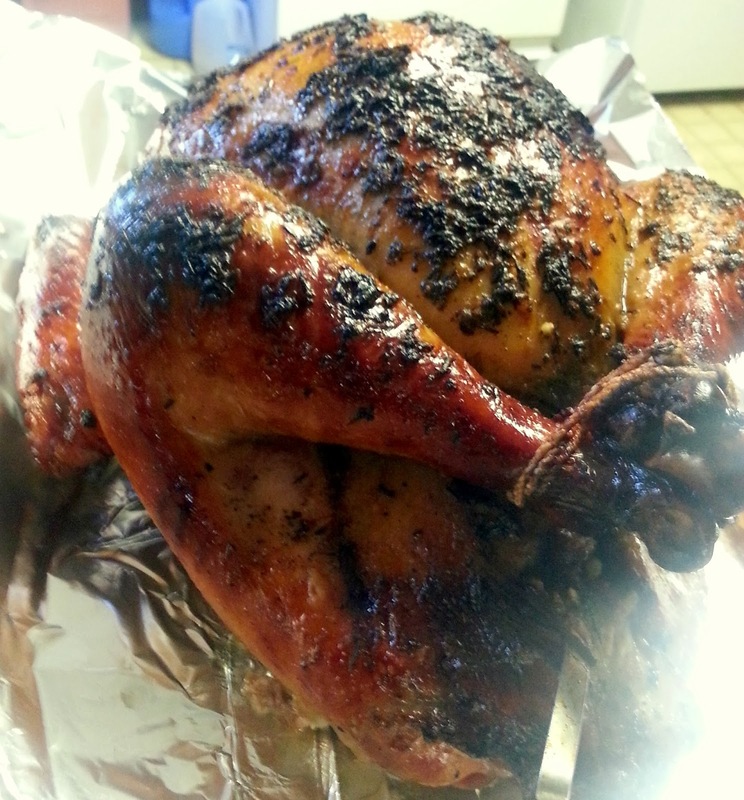 The cider gravy on this turkey was exceptionally yummy! 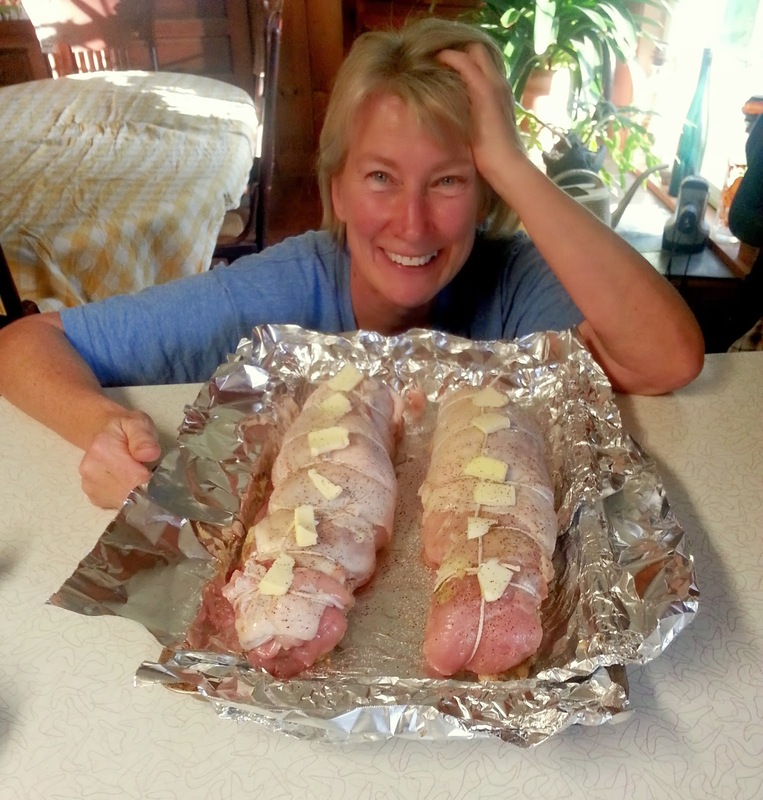 Here are the Turkey Roulades all stuffed, tied and ready to roast. These turkey breasts had a traditional bread stuffing and I served them with rich brown gravy (recipe also on the last blog). 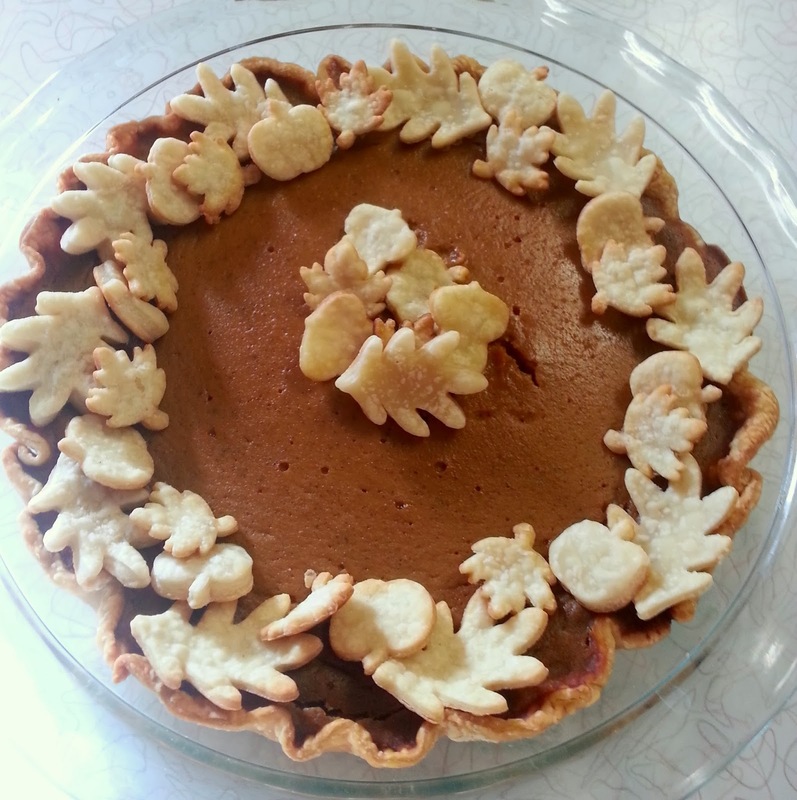 Very easy and can be done a day ahead of time and just reheated on Thanksgiving morning. 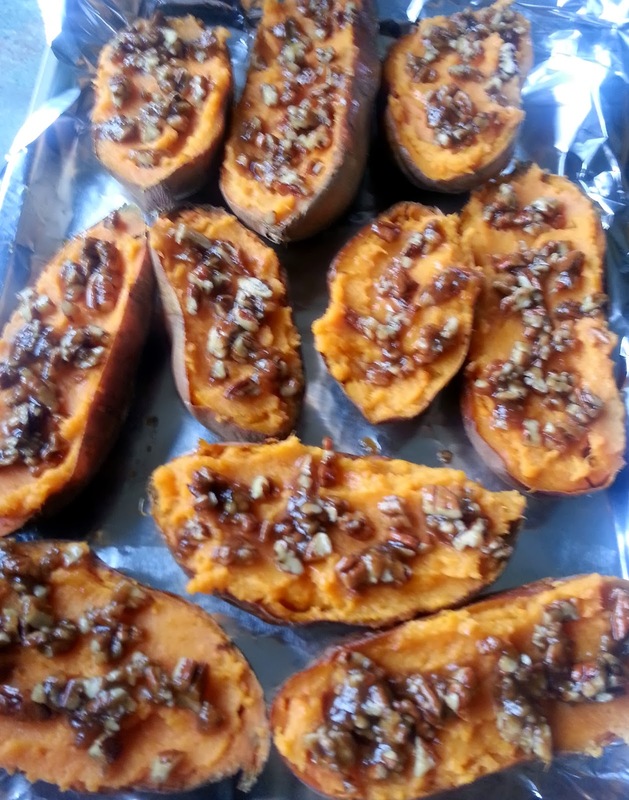 Bake the sweet potatoes at 375 degrees until very tender. Let cool. Carefully scoop out the centers and mash with butter, a splash of cream, salt and pepper. Refill the skins. Melt about 1/2 stick butter (depending on how many potatoes you have to top.) Add 1 Tbsp. of brown sugar, dash of salt and about 1/4 cup of pecans. Top the potatoes with the butter mixture and either bake for 30 minutes until hot and bubbly or cover with plastic wrap and refrigerate overnight. Before you reheat them the next day, bring to room temp on the counter and then bake at 350 degrees for 30 minutes. Even those who say they don't like spinach will probably love this dish. It has a delicious mild and creamy herb flavor! This dish can also be made a day ahead and baked just before your big dinner. If you are doing ahead, wait to top with bread crumbs until just before baking so they don't get too soggy. I doubled the recipe for 7 of us and there were NO leftovers! Preheat oven to 400 degrees. Saute onions in 1 Tbsp. butter until soft; about 5 minutes. Add flour and stir to coat onions. Gradually whisk in the milk and heavy cream stirring constantly to prevent lumps. Simmer for a couple minutes. Stir in Boursin a little at a time until melted and smooth. Remove saucepan from heat. Add spinach, parmesan, lemon zest, and seasonings. Transfer spinach to a buttered baking dish. Combine crumbs, 1 Tbsp. butter, Olive Oil and salt and pepper. Top spinach with crumbs, gently packing down to stick to the spinach. If you are not doing ahead, bake for 20 to 25 minutes until crumbs are golden and sauce is bubbly. If you are doing ahead, wait to top with crumbs. Cover with plastic wrap and refrigerate. Bring to room temp and add crumb topping before baking. 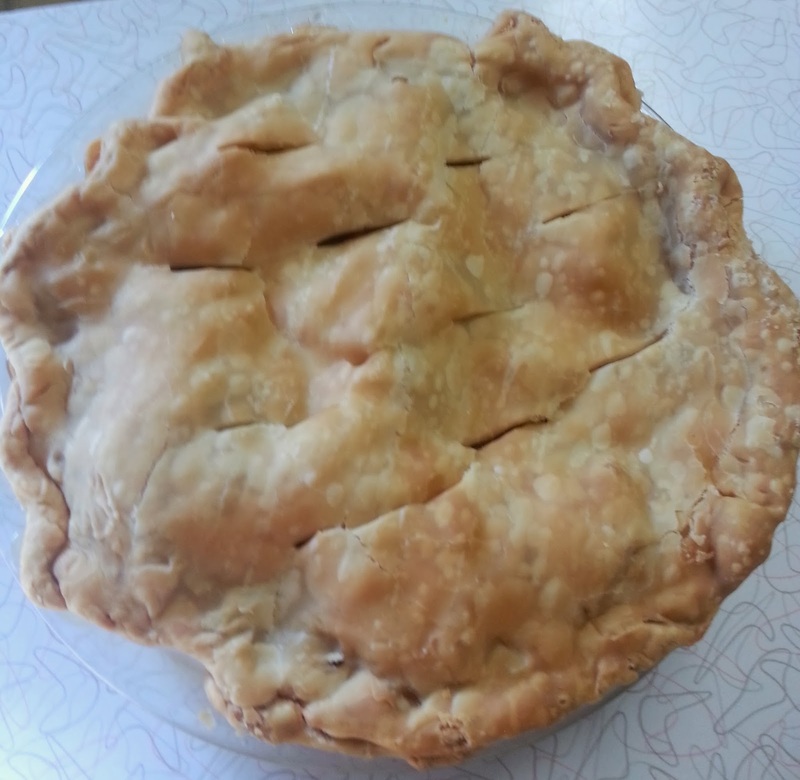 We also had a surprise from my nephew, Chris who brought a rich and flavorful pork pie. He got the recipe from a friend's French Canadian grandmother. He has yet to share it with me, but I can't wait as this was a delicious and creative addition to the Thanksgiving banquet. 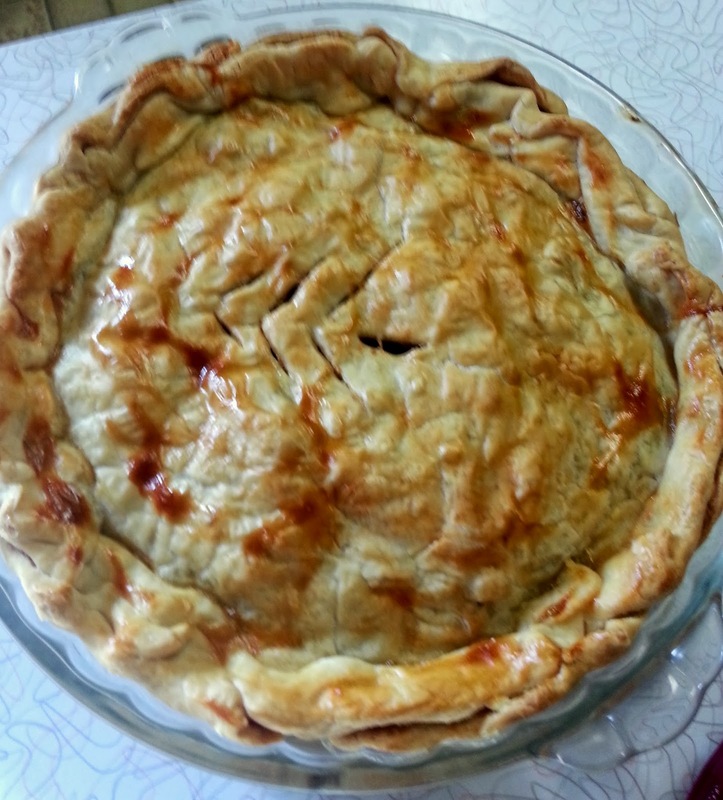 My brother, Skip and his wife Esther brought 2 beautiful pies: Apple and a Bourbon scented Pumpkin Pie with a very decorative crust. Heat the oven to 350 degrees. Grease the bottom and sides of a 9x2 1/2 inch (or higher) spring-form pan. In a food processor, process the cookies with the pecans, sugar, salt, and cinnamon until the cookies become fine crumbs, about 20 seconds. Add the melted butter and pulse about 10 times just until incorporated. Wrap the outside of the prepared spring-form pan with a double layer of heavy-duty foil to prevent leakage. Using your fingers or the back of a spoon, press the mixture into the base and part way up sides of the prepared pan. Use a flat-bottomed, straight-sides glass to smooth the crumbs over the bottom and farther up the sides, but not all the way to the top. Be sure to press the bottom thoroughly so that the crumbs are evenly distributed. Lay plastic wrap over the crumbs to keep them from sticking to your fingers to continue pressing the crust to a thin, even layer. Cover the pan with plastic wrap and refrigerate until needed (or overnight if doing ahead). 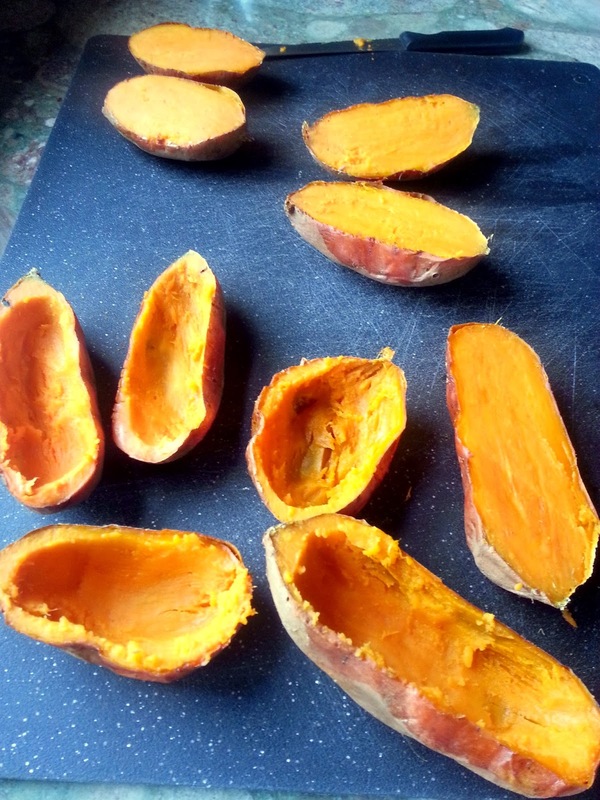 In a small, heavy saucepan, combine the pumpkin puree and sugar. Over medium heat, bring the mixture to a sputtering simmer stirring constantly, about 5 minutes. Turn the heat to low and cook, stirring constantly, until the mixture has darkened and thickened to the consistency of applesauce, about 5 minutes. Scrape the mixture into a food processor (I used a blender.) Process/blend for about a minute with the feed-tube open so steam can escape, scraping down the sides. With the motor running, add the chilled cream, softened cream cheese and process for 30 seconds or until smoothly incorporated, scraping down the sides as needed. Add the eggs and yolks and process for about 5 more seconds. Pour the batter into the prepared pan. Set the pan in a larger pan and add hot water to come up halfway on the spring-form pan. Bake at 350 degrees for 45 minutes. Turn off the oven without opening the door and let the cheesecake cool for 1 hour. Transfer the cheesecake to a rack (center will be slightly jiggly) and cool to room temp, about an hour. Arrange the pecan halves around the perimeter of the cake. In a large bowl combine all ingredients and mix with the mixer on medium until well combined. Put it back into ice cream container and freeze until firm, about 4 hours. How simple is that?? And doing so much of the dinner ahead of time made Thanksgiving morning very relaxed. I even got to watch a little of the parade! Hope your day was also happy...bellies filled with delicious food and hearts filled with the love of family! 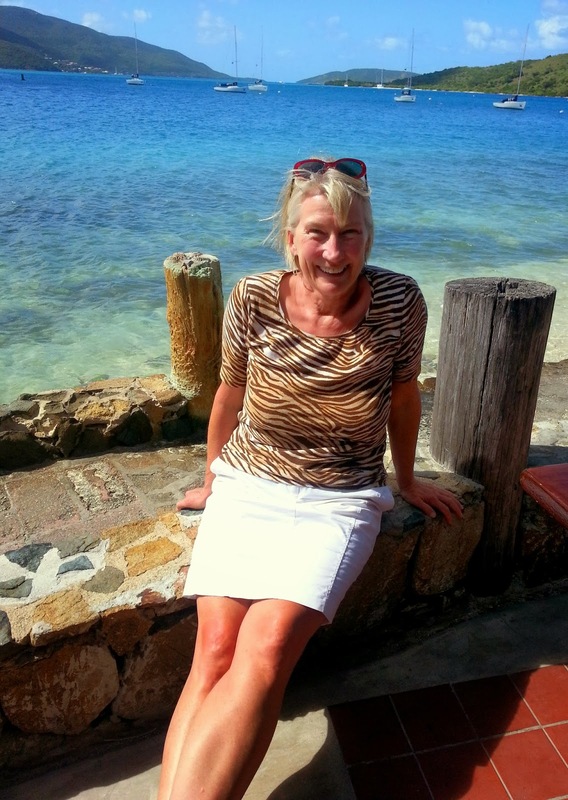 I am very excited to share some Caribbean cooking with you next time. We are also rolling right into Christmas...I am working on the menu as we speak! fabulous piece of Pan-seared Grouper!